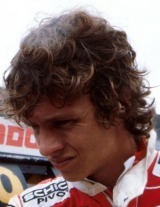 This diminutive Dutchman won the 1978 European Formula Three title and advanced to Formula One in 1979 with Shadow. The cars were uncompetitive, and spells with ATS, Ensign and Theodore did little to establish Jan, but he made his name as a sports car ace, winning at Le Mans for Jaguar in 1988, a year in which he also scored the first of his two wins in the Daytona 24 Hours. Jan returned to Formula One in a March in 1992, but plans for 1993 were thwarted when the team was forced to close its doors. Jan still races and won the FIA Sports Car crown in 2003. He also runs the Dutch A1GP team.